BetOnline Poker is the newest USA friendly poker room available. BetOnline is also the only poker room that offers a downloadable version of their software for Mac. Deposit at BetOnline with an eCheck directly from your personal checking account. BetOnline also has very good USA credit card acceptance rates. 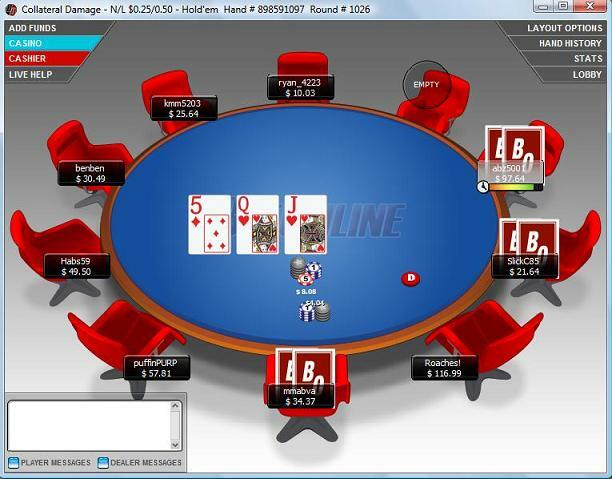 First known for their sportsbook, BetOnline has only recently entered the poker market. Don't expect huge site traffic here as they run on their own network, but as more Americans become aware of the great deposit options the site traffic is sure to grow. Receive a 25% bonus on every deposit over $50. The bonus is awarded in "promo bucks" which can be used to enter tournaments. We would like to see a more standard bonus here and have suggested this to BetOnline. Hopefully in the upcoming month or two we will see a change. BetOnline has the best deposit option of all, eChecks. Deposit to your poker account instantly from your checking account. Also find the USA credit card work very well here. During our BetOnline review the eCheck option was not available about 50% of the time however our Visa and American Express cards were always approved..
BetOnline Poker offers NL, PL and Limit Texas Hold'em, Omaha, and Omaha Hi/Lo. Tournaments are offered 2, 6 and 10 seated for both multi table and sit 'n go tournaments. Blind structures include regular level blinds and turbo where the blinds increase every 5 minutes. Because they are a new poker room and most players were recruited through the sportsbook the play is loose. You find a lot of highly experienced poker players here yet and as a result you make some money through the loose play. BetOnline also offers an Online Casino and Full Service Sports Book. BetOnline operates on their own poker network and the site traffic needs to grow some. NL Hold'em games are available regularly up to $10/20 and sit 'n go tournaments are hit and miss. Tournaments do fill up to the $100 buy-in level but you may have to wait a little before they fill. Lower stakes receive better traffic. Because this is a relatively new poker room the competition is soft. Look for some weak players at cash ring games because most players were recruited through the sportsbook. Be patient at cash rings and you can cash in on some big pots. Before our review we didn't play at BetOnline very much but now it is one of our favorite USA poker sites for cash ring games. You can't find much better. In business for over a decade BetOnline knows how to treat their customers and offer every way imaginable to do so. Reach the service staff by e-mail at cs@betonline.com by calling 1.888.426.3661 or by LIVE Chat. During our review phone operators spoke very good English and were very polite. Sign up now at BetOnline Poker or Download BetOnline Poker directly. We hope you found our BetOnline Poker review informative. 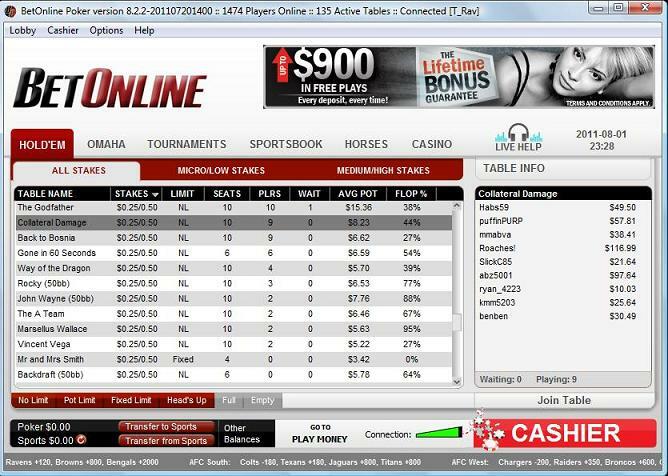 While larger tournaments are not always readily available at BetOnline the fishy and loose competition make up for it. BetOnline is one of our favorite USA allowed poker sites for cash ring games.